Pearson Ranch, known for growing and shipping the absolute finest Navel and Valencia Oranges, is now happy to introduce you to our very own brand of Juice Oranges called..."L O V E". Whatever you do, don't think for a minute that these oranges are not as sweet and delicious as our Pearson Ranch Premium Grade Oranges. The only difference is the fact that these oranges aren't quite "pretty enough" to make it into our "Premium" brand box. Bursting with juice and flavor, these juice oranges are sure to make the perfect glass of deliciously sweet and nutritious tree ripened orange juice. 1. When you sign up for the program and pay for your first order, we will ship out your first box of LOVE Oranges. 2. Then, each month there after (until the season is over), we will call YOU and ask you if you are ready for your next month's shipment. 3. At that time we will verify your shipping information (just to make sure you haven't moved). 4. Next, we ask you for authorization to charge your credit card for your order. 5. When authorization is complete, your next box of juicy LOVE Oranges will soon be on its way! 6. As a special "Thank You", when you join the Pearson Ranch Monthly Orange Delivery Program, you save $5.00 off of the regular "non-member" price per box! 7. Finally, just to keep things simple...if at any time you wish to "opt-out" of the program...just let us know and we will take you off the list. No pressure, no hassle, nothing to ever buy again. So when you're ready for 35 lbs. 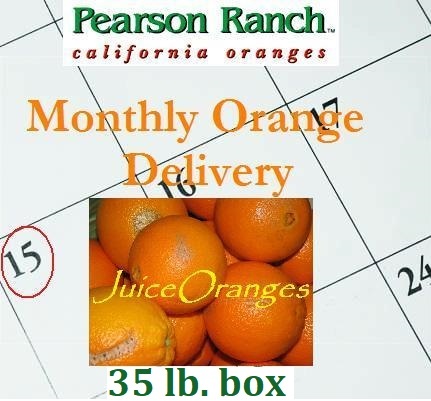 of sweet and juicy California "sunshine" to greet you at your door step, Pearson Ranch is ready for YOU, with our "Monthly Orange Delivery Program". What if you want oranges other than just every month? Pearson Ranch is happy to accommodate! We can set up a delivery schedule that suits your particular needs. Every 2 weeks, 3 weeks, 5 weeks, etc., you can even change your order from 20 lbs. to 35 lbs. (and vice-versa) of fruit at any time with just one phone call or e-mail! Our goal is for you to have oranges when you want them! For more information please call 888-667-2643. We are currently shipping NAVEL Oranges in all our 20 and 35 lb. boxes. Monthly Juice Oranges 35 lbs.